With a bright and beautiful smile, you can discover the confidence that will lead to your storybook ending. At Dental Design of Rockland, we use the latest and most effective tooth whitening methods. Prepare to see impressive results—fast! Maximum Safety | Your dentist has the experience and technology necessary to reduce tooth whitening risks. Bleaching with some materials can lead to gum irritation, tooth sensitivity, or uneven color and spots. With a trained professional and a high quality formula, you can avoid these consequences. Accelerated Results | There is no faster way to see brilliant results than in-office whitening. If you’re ready to see a stunning smile in one appointment, ask Dr. Ollech about brightening your teeth with Zoom! whitening. Low Sensitivity | Your professional team help control your tooth sensitivity. Many patients suffer pain with store bought bleaching kits, but following our pre-whitening protocol and using our in-office formula helps safeguard against sensitivity. With Zoom! in-office whitening, you can brighten your teeth up to 10 shades in just one hour. Sit back and relax while Dr. Ollech uses this customized and protective formula to give you your ideal smile. For every patient who uses Zoom! In Office Whitening, we provide take-home trays for at-home whitening enhancement or touch ups. We understand that our patients want their bright, beautiful smiles to last. We want to provide gorgeous smiles for life! That’s why we provide free booster materials for all patients who use Zoom and come in regularly for recare visits. At Dental Design of Rockland, it’s easy and convenient to maintain a pearly white smile for life. Keep up with your regular appointments and you’ll always receive the materials you need to preserve your perfect grin! 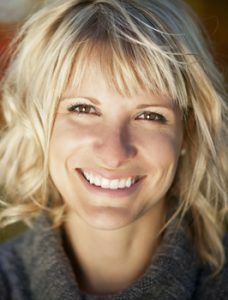 If you’re ready to create a stunning white smile, come speak to Dr. Ollech. She will listen and guide you in the best way to achieve a dazzling smile! Call us at Dental Design of Rockland to schedule your consultation.